A hand drawn honour roll, with watercolour paintings of local scenery at the top. There are flags on both sides, including France, Belgium, Russia, United Kingdom, United States of America, Japan, Italy, Queensland, Victoria, New South Wales and Western Australia. At Oldina a few days ago the unveiling of a roll of honour, prepared by Mr. Alfred Bock, was unveiled in the State school. Mrs Bock, as a mother of three soldier sons, unveiled the roll, and the National Anthem was sung by all present, the school-children, under their teacher (Miss Fitzpatrick), continuing with "Soldiers of the King," and "Keep the Home Fires Burning". The roll, which is encased in a handsome oak frame, was designed and executed by the donor, measures about 3ft. x 2ft., and is admirably finished in water-colour. 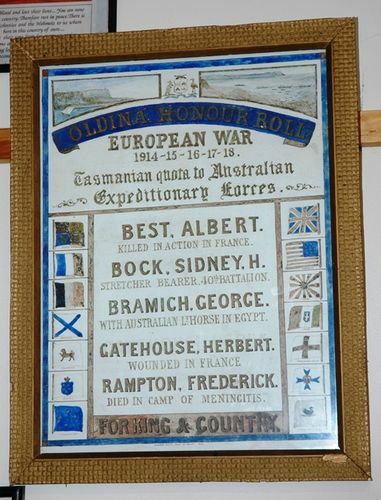 Above ths title scroll-gold block letters on a blue ground-and in addition to the Commonwealth coat of arms, are two water-colour sketches, one of Table Cape and the other of Gallipoli Peninsula at the time of the landing. Down each side are ranged the flags of our Allies, and across the bottom appears the inscription "For King and Country." The names appear in gold. The Mercury (Hobart), 24th May 1919.